Home Brownie's Bites Brownie’s Bites: F*****d by the Fun police, Again. Someone said that in my 82 year tenure on this ball of dirt, starting in 1935, that over 800 laws have been enacted, on every level of daily life. That is just so wrong. For nearly every new law or rule, another snivel servant gets his wings, just like an angel…. He or she also gets a salary, retirement, and probably a car. One can hardly do anything without some official telling you why you can’t, at least for free, or, if it is really fun, why you can’t do it at all! 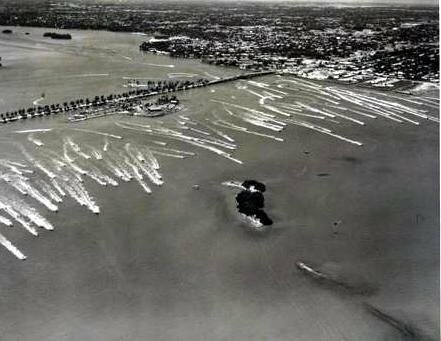 My own pet example of that situation is the late “Gold Coast Marathon” boat race, which, starting in 1947 or 49, depending on whom you ask, ran from Pelican Harbor Yacht Club, on the 79th Street Causeway in Miami, to West Palm Beach, and return. It is about 62 miles from one to the other, and even back in the canvas hat and silk scarf days, was often covered in about an hour each way. The race ran each year in July, north on Saturday, and back on Sunday. There was a layover (draw your own conclusions) in West Palm Beach on Saturday night, including a banquet of sorts, with a Carnegie Hall sized band playing the intro to “Anchors Aweigh” incessantly for three or four hours. Much drinking, lying, alibis, excuses for poor performances (draw your own conclusions), LWI’s (Lying while intoxicated), sabotage, various white slavery infractions, the usual. The fact was, there was some terrific boat racing going on. I personally participated seven or eight times, and loved every minute of it. If you like to see lots of really fast boats racing together, visualize the start, at Pelican Harbor, with a record 248 boats STARTING AT THE SAME TIME, all running for the draw span of the Broad Causeway, a couple of miles north, then on up the Intracoastal Waterway to West Palm. Amazingly, in all 15 or 20 years (depending on whom you ask), no one was seriously injured in the race. The worst injury that I recall was Del Daily in the “Oh! Mona” F-Service Runabout, jumping the wake of a Coast Guard Auxiliary boat whose sharp-eyed helmsman had spotted someone having fun, and crossed the inland waterway to stamp it out before it spread. Having spent my entire life (so far) in the boat business, building, selling, racing, fishing, funning, and such, I have seen lots of wondrous sights. I have seen the sun rise on Mont Blanc, the girl at “Crazy Horse” in Paris, with the three tassels (draw your own conclusions), and Brad Schoenwald pick up a check. The most vivid memory of a new boat was at the Pelican Harbor Yacht Club, circa 1961, when the Switzer brothers, Bob and Dave, pulled in with original Switzer Hydrocat. It was white and mahogany in color, had pair of 80HP Mercury outboards (The largest at the time) with Speedmaster lower units mounted 8 inches too low (I thought). I was awestruck. This boat skimmed just above the surface of the water with only the propellers in the water at 100MPH. A year or so later, Miami’s Dave Craig ran it in the Marathon, making it from West Palm Beach to North Miami in 45 minutes or so, but crashed on a wake a few miles from the finish. The Yacht Club area was rife with every class of limited race boats, plus houseboats, experimental boats, you name it.